Matías Ruíz Blanco (1643-1705/1708?) was a Franciscan friar who served as a missionary, historian and linguist in colonial Venezuela. Born in the village of Estepa in the Spanish region of Andalusia, he was devoted from early youth to religious practice. He was most probably educated in the Convent of Grace. By the age of 23 he was already recognized as a teacher of philosophy at the Monastery of the Valley in the Province of Seville. In 1672, during the third Franciscan expedition to America, he was sent as new lector of philosophy and theology. 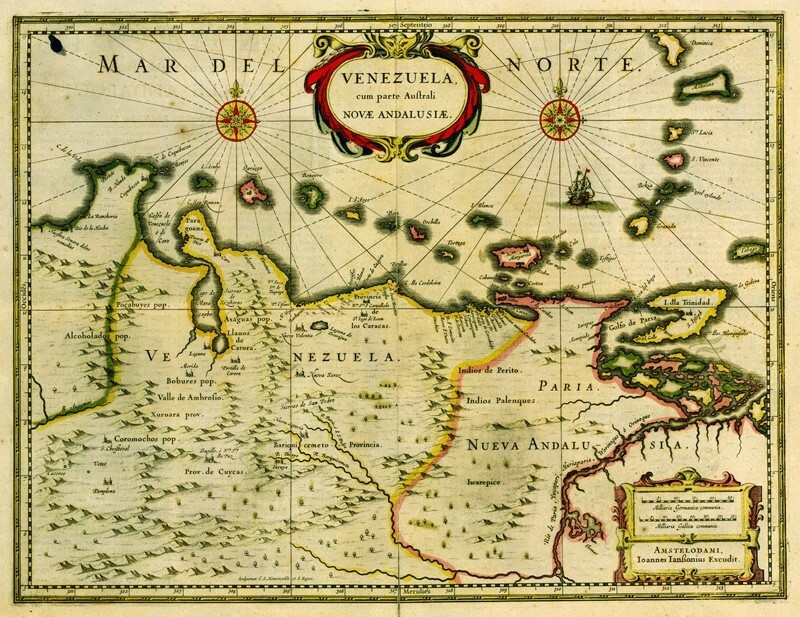 He continued teaching until early 1675 when, together with other fourteen missionaries, he was sent to evangelize the indigenous people in the province of New Andalusia, Cumana, on the banks of the Orinoco river and in other parts of Southern Venezuela. He was therefore engaged in converting the Cumanagot, Chaima and Palenque indigenous peoples to Catholicism. He was elected superior of the missions of Piritu three times and in 1683 (as indicated in his works) he was made synodical examiner of the diocese of Puerto Rico and provincial commissioner of the San Francisco Order. He most probably died at the end of his third and final prelacy, around 1708. In Antonio Caulín’s Historia corográfica, natal y evangélica de la Nueva Andalucia (1779) there is a different death year indicated. 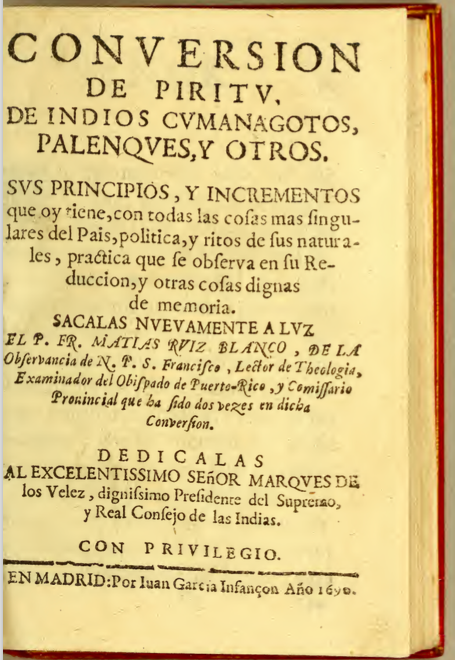 According to Caulín, he must have died in 1705, after having composed significant works related to the history of the indigenous peoples in the Province of Cumana: Manual para catequizar y administrar los santos sacramentos a los indios que habitan en las provincias de la Nueva Andalucía (Burgos, Juan de Viar, 1683) and Conversión de Píritu de indios cumanagotos, palenques y otros (Madrid, Juan Gracia Infançon, 1690). Living amongst the Cumanagot and the Palenque peoples, Ruíz Blanco became a determined missionary, walking miles to take care of the spiritual and physical needs of his charges. He returned to Spain several times, where he acted as a representative of the missionaries in their attempts to ensure government support for the protection of indigenous people against the abuses of the Spanish colonists. He also took the risk of creating subversive discourses against the evangelization policies that ruled in the Americas, such as the canonical Third Provincial Council of Lima from 1582-83. The main purpose of his missionary text Conversión de Píritu (1690) was both to engage and to guide prospective missionaries in the Province of Piritu, though he was very clear in respect to the dangers and struggles to be overcome. The final result was a hybrid text composed of five different sections, among which we can identify a historical introduction, the principles followed in the translation of Christian texts into indigenous languages, the precepts of the Decalogue and of the holy Church, a grammar of the Cumanagot language and a Spanish-Cumanagot vocabulary. Although the initial goal was not to create linguistic artefacts, Spanish missionaries who arrived in America began to explore various linguistic adaptation strategies to find ways of overcoming the difficulties of translating religious terms that did not exist in the indigenous languages and to begin the evangelization process. To avoid confusions and misunderstandings regarding the religious concepts, some missionaries decided to introduce loans from Castilian (hispanismos), others employed as linguistic strategies literal translations (ad literam), while others opted for the use of neologisms or semantic use of substitutions and additions (ad sensum) and linguistic adaptation strategies. Matías Ruíz Blanco’s philological awareness allowed him to translate the main prayers and the principles of Christian life into the indigenous languages in the Province of Cumana. He openly showed his disagreements with the translation guidelines imposed on the “New World” at that time by the 3rd Council of Lima (1582-83) in the methodological handbook Epístola sobre la traducción, published in Doctrina cristiana y catecismo para instrucción de los indios y demás personas que han de ser enseñadas en nuestra fe (Anonimus, 1584). He pleaded constantly for a different method of translating religious doctrine, in spite of the official guidelines. He stated his own approach to the indigenous languages and described his technique by arguing the advantages of his linguistic decisions, given the peculiarities of the language context in which he was working. Although at the beginning these comments were made in the prologues of his works or were inserted in between the lines of the catechetic texts, in Conversión de Píritu (1690) he dedicates a full chapter to evangelization practices and his translation principles, Práctica que hay en la enseñanza de los indios, con directivo para que los religiosos puedan cómodamente instruirse en las cosas esenciales de la religión cristiana. […] in one of the Councils of Lima there is a guideline for the translation of Christian doctrine, which [recommends that] when some terms in the languages of the Indians are missing, they must be replaced with others of the Spanish language; then it does not prevent from filling Castilian voices with those of any other language of the Indians […]. […] hence are the teachers whose doctrine is composed of artifice looking for applause and esteem rather than for the winning of souls; they work and disclose in vain and they belong to winds of vanity of the world, being swept away easily, and thus they spoil their studies and they do not take advantage of them, nor other people born in ignorance or experienced in Christian doctrine, and so little amend their vices, yet for this cause they grow more and more. 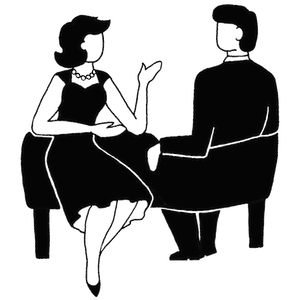 The translation practice undertaken by this missionary is characterized by a commitment to the role of mediator that he played during the evangelization process. He is fully aware of his responsibility as translator-author of the religious works to be used within the Christianization activities. Ruíz Blanco reveals a conception of the missionary translation project which, seen from a modern perspective, reveals itself as an epistemic (not only teaching) project, a discursive plan adapted to the characteristics of the indigenous community to which it was addressed. As it can be read in his works, he was involved in a relentless pursuit of a discursive identity through linguistic adaptation strategies within the idiosyncratic framework of the indigenous languages in the Province of Cumana. From Latin (translātor, ōris, m. transfero > one who carries or hands over, a translator; prōdĭtor, ōris, m. prodo > a betrayer, traitor) this expression means translator traitor and it refers to the “untranslatability” or the difficulty to reconstruct the “complete” meaning of the Christian doctrine into the indigenous languages. All the translations in the text are mine. Bastín, G. L. and Pérez Arreaza, L. (2004) Las traducciones franciscanas en Venezuela: entre la práctica y la teoría. Histal: Université de Montréal. Canada. Vega Cernuda, Miguel Ángel (2014) La Conversión de Piritú de Matías Ruiz Blanco, OFM, un texto híbrido de lingüística, traducción y etnografía. In-Traduções, Florianópolis, v. 6, n. p. 155-170.